When you are done with creating your scenario and adding 360˚ video to all the scenes, you are ready to publish. Publishing means the final step to get your scenario in the mobile app. There are three checks in the Publish process. 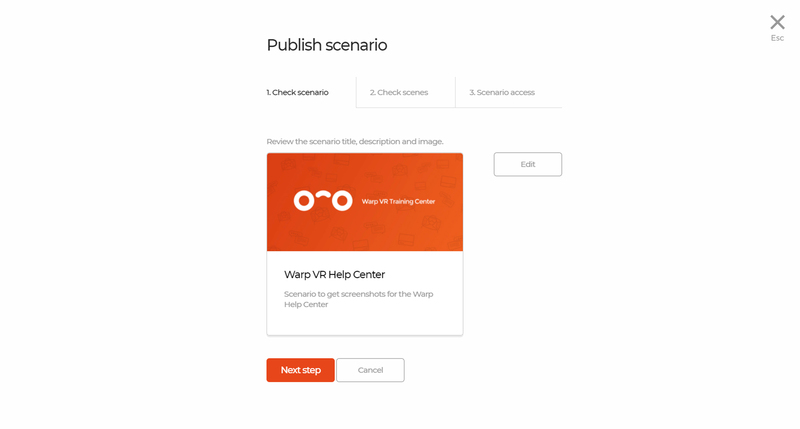 Click 'Publish' in the top right corner to start publishing your scenario. The first step is to check whether you are happy with the scenario title, description and image. If not, you can change this directly. Missing links > Does a scene contain a missing links? If yes, your VR scenario might not work correctly. Fix and publish again. Missing videos > Is a scene missing a 360˚ video? If yes, please fix. Otherwise trainees might see nothing. Missing scene information > Is there a scene which is not connected with another scene. This means that trainees can never see this scene, because no choice of another scene is linking to this scene. Missing ending information > Is there an ending in your flow diagram which doesn't have a connection to another scene? Invalid videos > The videos for a scenario all need to be recorded with the same amount of frames per second (fps). If the fps for all individual videos are not equal you might have problems viewing your scenario. If some things aren't in order, you can still publish, but your scenario might not work properly. The last step is to choose the trainees which will get access to your scenario. 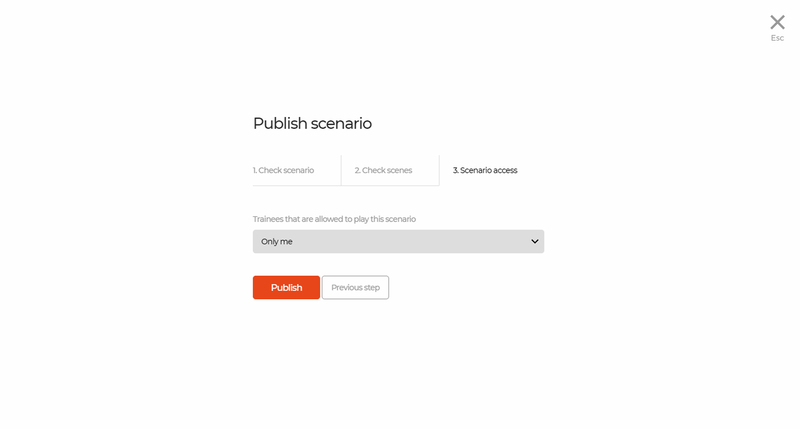 After publishing, the status of your scenario changes from 'Draft' to 'Published'. Changing a published scenario will change its status to 'Modified'.